There are times when you want to free up your Managed licenses as you no longer need to have unattended access to those devices. On occasion, however, you need to be getting more regular audit information of certain devices and the ability to run jobs on them, therefore, you would need to move them to a Managed site. You may even want to simply move a device from one site to another because the device was added to the wrong site. Switching devices between Managed and OnDemand sites is possible in both directions as long as you have enough free licenses available of whichever site type you are trying to convert to, otherwise the device will stay in its original site. You cannot have a site that mixes OnDemand and Managed devices. Everything in the site is defined by the site type. To find out how to create a new site, refer to Add a site. In the Datto RMM Web Portal, click on the Sites tab, and select the site from which you would like to move your device. Click on the Devices tab and select the device you want to move by clicking the check box next to the name of the device. Click the Move device(s) to different site icon from the action bar. Select the site that you want to move the device to from the list, or type the name of the site into the search bar and then select the site from the updated list. Click Move and observe the message indicating that the device has been successfully moved to the new site. When you are moving a device from a Managed to an OnDemand site or vice versa, you will receive a warning message to inform you about how this will affect billing. Click OK to continue. 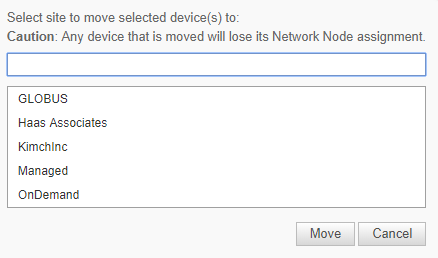 When you move a device to a different site, its network node assignment will be cleared. If you move a network node device to another site, its association to network devices will be cleared (and the network devices will go offline), however, it will keep its network node status in the new site. Once the device has been moved, the Agent will switch over the next time it connects to the platform. When Managed devices are converted to OnDemand, it should happen within a matter of minutes. When OnDemand devices are moved to a Managed site, it could take up to a week (since OnDemand Agents only connect every 7 days to update their audit data). You can speed this up if you open the Agent Browser on the device you want to convert and click the Connect button. For billing purposes, devices will retain their site type until they connect to the server. In other words, if you are at your purchased Managed device limit and move some Agents to an OnDemand site to free up Managed device licenses, those licenses won't be available for use by new devices until the Agents you moved have finished checking in to the platform.